Our Farm specializes in growing the highest quality leafy greens and culinary herbs. We work with an array of partners to curate our locally grown products exactly to their needs. We are what we eat, and UP's greens are grown naturally using no pesticides or harmful chemicals. Our produce is grown with love and care by next generation urban farmers to promote balanced health and nutrition. Using precision growing methods, UP provides restaurants, schools, and institutions with a year-round, local supply of greens & herbs grown to the utmost quality and least ecological impact. 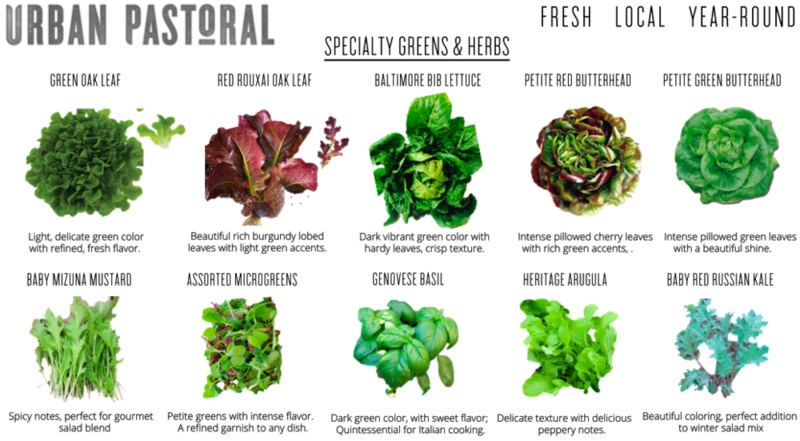 We provide the freshest local greens in Baltimore. Grown locally, year-round in the city, our produce is harvested and delivered daily to ensure that customers enjoy delicious homegrown greens. Eliminating the distance from farm to fork, freshness is at the core of our model. Want fresh, local greens in your kitchen?